Maybe it was the recent Atari 2600 milestone anniversary that fueled nostalgia for the golden days of computer and console gaming. Every Game Boy must ponder his roots from time to time. But whatever is driving the current retro gaming craze, one thing is certain: classic games are back for a big second act, and they're being played in both old and new ways. 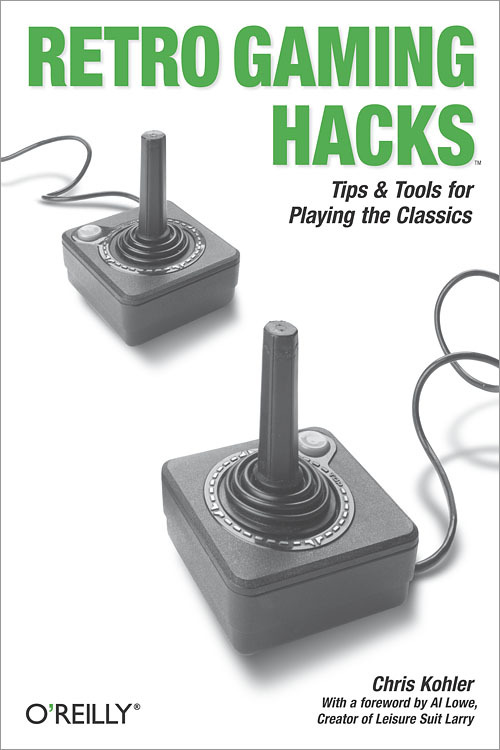 Whether you've just been attacked by Space Invaders for the first time or you've been a Pong junkie since puberty, Chris Kohler's Retro Gaming Hacks is the indispensable new guide to playing and hacking classic games. Kohler has complied tons of how-to information on retro gaming that used to take days or weeks of web surfing to track down and sort through, and he presents it in the popular and highly readable Hacks style. Retro Gaming Hacks serves up 85 hard-nosed hacks for reviving the classic games. Want to game on an original system? Kohler shows you how to hack ancient hardware, and includes a primer for home-brewing classic software. Rather adapt today's equipment to run retro games? Kohler provides emulation techniques, complete with instructions for hacking a classic joystick that's compatible with a contemporary computer. This book also teaches readers to revive old machines for the original gaming experience: hook up an Apple II or a Commodore 64, for example, and play it like you played before. A video game journalist and author of Power Up: How Japanese Video Games Gave the World an Extra Life, Kohler has taught the history of video games at Tufts University. In Retro Gaming Hacks, he locates the convergence of classic games and contemporary software, revealing not only how to retrofit classic games for today's systems, but how to find the golden oldies hidden in contemporary programs as well. Whether you're looking to recreate the magic of a Robotron marathon or simply crave a little handheld Donkey Kong, Retro Gaming Hacks shows you how to set the way-back dial.